Moroni? moron? moran? You decide. We look forward to seeing him! You nailed it again, Author. The Mormons are an even greater mystery than regular Christians. I mean, they all seem like nice people, and some of them are quite bright. For example, our second favourite web cartoonist, the brilliant and witty Howard Tayler of Schlock Mercenary fame, admits to being a devout Mormon. The mythology behind the cult should make anybody with half a brain blush, but doesn’t seem to. They can tell you their story with a straight face. Truly strange. Final prophet, eh? There were a lot of Mormons doing a lot of prophesizing after Smith died. Uh-oh! So now it’s gonna be Jesus, Mo & Joe?!? Doesn’t Joe have his own planet to worry about these days? Somewhere near Kobol? How does he have time for Facebook? It raises the point that I’ve thought for a long time. If Jesus did have a second coming (let’s accept he had a first coming for a second) tomorrow, you just know that every single major Christian leader would denounce him as a delusional idiot – as has happened many many times. Yet they all still claim to be waiting for him to return. The final prophet of God? A ludicrous claim: only the Church of Scientology helps us to become certain of our spiritual existence and our relationship to the “Supreme Being”. Plus there are evil aliens, immortal spirits, and a history of a galaxy far, far away. How could anyone doubt that? Bring on L. Ron, too! After the second coming will there be two christmases every year? Things that they really don’t know. I’ve recently read that going back in time is a theoretical possibility. I also recall, when I started to read the Book of Mormon, that the device that showed Joseph Smith the pre-history of the USA could very well be compared to a laser-powered 3D/holographic display on something like a DVD player or laser-stage – something that would have been beyond his knowledge, but not necessarily beyond prophetic imagining. I don’t buy the story but I can imagine a scenario in which the story is made into a 3D/holographic film and a copy together with the player taken back in time and hidden (like a time capsule) for Joseph Smith to find. Now, who’s got the fevered imagination, Joseph Smith or me? The “final” prophet tells a tale that’s even more ludicrous than the ones before him. People really are idiots. I don’t think that Joseph Smith was worst than Moses, Jesus or Mohammed. All of them, deserve time in JesusandMo.net. Surely, Bob Henderson does too. It was just a matter of time before God knew that white Americans had to be his vehicle to communicate to the world. After all, white Americans are superior to everyone else—or why would God have chosen them? the ability of people to see a problem with other people but not themselves is astounding. Excellent – when’s L.Ron Hubbard make an appearance? Are you making fun of the Angel Moroni…er, whatever it’s name is? That’s just awesome! Just say, “no” to moron…errr, Mormon. Nassar Ben Houdja, for once in your life you are right on the nail. Most religions have their origins buried so far back in antiquity that they are very difficult to disprove. Mormonism on the other hand was established relatively recently and is well documented as being false. When it comes to religion this difference seems to be entirely irrelevant. there must be a lesson in this somewhere. Just brilliant. And how did the anniversary go? 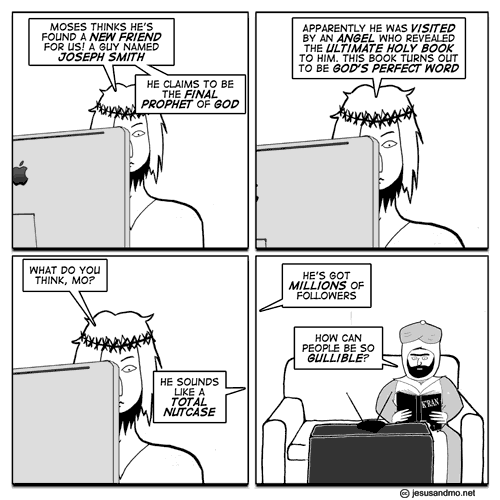 Did Moses show up in the end? Mormons are different from Muslims in that they don’t believe their founder to be the final prophet of God. Indeed, they have alleged prophets to this day who act as Pope-like leaders. 2. What do the people who put all sorts of bigoted comments here believe THEMSELVES? Would be a good idea if posters had to declare their own “disclosures” before their comments. Nobody has a clue. Especially that dork Dawkins, a religious fanatic about big S science, who seems incapable of being embarrassed by his own false Religion euphemistically called “Science”. Joseph Smith? I used that name once checking into an hourly motel. I guess I was divinely guided, with a second coming and calling out to a holy spirit! Frame four put the IronyMeter into orbit, and to think the warranty on it just ran out last month. @Himagain 60 years of science? Wow. I’m impressed. But science is a big area. I know a guy who says he’s a scientist but his “discipline” is homeopathy. So, what’s yours? I believe that any true scientist is an agnostic, but a “teapot agnostic”. That’s what I am. A teapot agnostic is close enough to atheist that I call myself an atheist just to avoid confusion. As for bigoted comments, your slur against Dawkins is beyond ignorant. To call him a religious fanatic is, quite frankly, stupid. You call yourself a scientist. From your comment I’d say that you don’t understand science, or religion, or the difference between the two. @Nibien You are much more concise and succinct than I can ever seem to manage. Thanks. Oh, I do hope this presages a new character to come! I am an atheist. There is just no way that Thor exists. I’m an atheist but I am willing to consider any evidence for a god of any kind if someone is willing to show me some. I also agree with the sentiments expressed by the ‘Russell’s Teapot’ meme. Require a giant leap of faith. 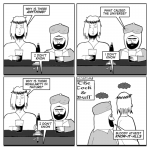 ‘TIS THE SEASON, AND THIS MOST EXCELLENT CARTOON PROVIDES AN OPPORTUNITY TO ANNOUNCE THAT, ONCE AGAIN, I OFFER EXCLUSIVELY TO READERS OF J&M MY FAMOUS AND POPULAR PHOTOGRAPH OF JESUS, SIGNED PERSONALLY IN DURABLE INK BY THE MAN/GOD HIMSELF. 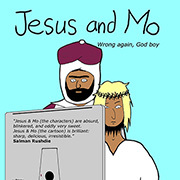 ALSO, THIS YEAR, I AM OFFERING LIKEWISE A PORTRAIT OF MO, SIGNED, BELIEVE IT OR NOT, “MO,” BY THE PROPHET HIMSELF. THIS TOOK SOME DOING, SO THE PRICE FOR MO’S PORTRAIT IS SLIGHTLY HIGHER. REMEMBER, ALL PHOTOGRAPHS ARE AUTHENTICALLY SIGNED BY THE SUBJECT HIMSELF. JESUS=35.00 (TWO FOR $60.00–GREAT XMAS GIFT! ); MO=40.00 (TWO FOR $70.00). SEND CASH ONLY. @Didac I’m unfamiliar with Bob Henderson. Can’t find anybody by that name who seems to derserve bandwidth on J&M with a Google search. To whom do you refer? I suspect Didac is referring to Bobby Henderson, first prophet of the Flying Spaghetti Monster. Thanks. Should have recognized the name since I have a link to his original letter to the Kansas School Board permanently displayed on my site. Makes me laugh every time I read it. Especially the “mountains, trees and a midget” line. @Ultimate-Evidence: how do you know that? @Poor Richard: just what I was looking for to decorate the attic. Hmm. All good stuff, but the Pope frikking allowed Condoms last week! C’mon Author! Get to it! Ridiculing religion is an endless source of amusement to we heathen … though sometimes even as we exult in the schadenfreude of mocking a twit like HimAgain are we not displaying a teeny bit of arrogance … it’s like all the clever kids ganging up in the playground to take the piss out of an intellectually disabled person. Also I sense that there’s not enough self-doubt in the “atheist community” – we should also be asking whether, given that such vast numbers of people worldwide to subscribe to some form of religious belief, are they not perhaps on to something – not the ridiculous beliefs themselves which are obviously cobblers, but the practice of religion itself. My wife is a churchgoer and she has twisted my arm into attending church services and getting involved in the events and causes that the church promotes. While I am still totally unpersuaded by any of the doctrinal shite which emerges from the pulpit, I find myself very impressed by the sincerity of the churchgoers and the depth of the relationships which have developed amongst them over the years. Also they develop programmes to assist the poor, the elderly, the unemployed, AIDs victims in Africa and Asia etc etc etc. So perhaps this is what HimAgain means when he denigrates Dawkins – Dawkins is certainly right to debunk religious doctrine, but he is probably wrong if he thinks that religion does not serve a useful purpose in society. Sorry about the serious note, love the strip as always author is spot on. Still we atheists should have a more open mind and attempt to understand the wider psychology and social purpose of religion if we really want to replace it with something better which dispenses with the BS but keeps the good stuff. However, it is also true that not one of the people that have a go at Dawkins have actually read him to any degree–he’s just vocal and visible and they have a go at that–so you have to expect a bit of coming to his defence when people are obnoxious and ignorant. Furthermore- unlike other picked-on groups who have members who want a bit of payback (e.g. feminists, racial minorities) atheism actually is better than theism. Because of facts. @Spoing Good point. In my defense, while addressing an ignorant idiot is not the time when my self doubt shows itself. Also I have absolutely no doubt about what you so aptly call the “shite” of religion. I too am surrounded by family and friends who are good people and seem to get a lot from their church. I try to tread gently on their feelings. I disagree with you that religion serves a useful purpose. That purpose is served despite religion, not because of it. The problem with being tolerant of religion, as I see it, is that you must tolerate child abuse in the form of indoctrinating children with nonsense. Does your church going wife send your children to Sunday School? If so, you might want to sit in and find out the kind of poisonous crap that is fed to kids in that setting. Are any of those autographs in Aramaic? That’s got to be good for at least a 10% bump in value to a collector like me. A signed image on a piece of toast, I’d pay money for that. with your own eyes and mind now. @Darwin Harmless – it gets better, wife has now been roped into TEACHING sunday school and I have been asked by pastor to assist – devout atheist that I am they are still happy to have me lead the little flock astray. So I will certainly be getting the inside dope. To be honest at this particular church the poison is so dilute that I strongly doubt the kids take any of it very seriously at all. Having reviewed the material we’re supposed to base the lessons on, it tends to consist of a reading from scripture, e.g. the hoary chestnut from the new testament where JC prattles on about the mote in thy neighbour’s eye, followed by which we would ask the kids to have a think about being judgemental about others, the negative impact of that, the importance of being self-critical also etc etc – no harm in that I suppose. Of course at some stage wife will “lead the little troop in prayer” based around the particular theme of the day. Thinking about it possibly even the prayer thing need not necessarily a bad thing if you look at it as an opportunity to get the kids to reflect on the needs / suffering of others around them and around the globe and consider how we might be able to do something about it. So from my point of view as a godless type who doesn’t believe there’s anybody out there listening I would treat the “prayer” time as an opportunity to get the little bastards to consider the needs of others besides themselves and to start thinking about how we can action some changes. So perhaps as atheists the best place to start eradicating the “stupid side” of religion is from the inside hehe. We’ll see how it goes anyway. @Darwin Harmless – one more thing. The reason I say that religion can serve a useful purpose is because it allows people to create communities to support one another emotionally and to provide a sense of belonging to a larger whole. It also provides the members of that community with the reassurance that their lives have meaning and purpose and that that meaning extends beyond their physical lifespan. So the attraction of religion is really a no-brainer. We heathen (and, I suspect, a good few of the devout themselves) all know that the nonsense which underpins all of this doesn’t hold any water, and we spend a good deal of time pointing that out e.g. right here at J&M. However it seems that the benefits which accrue with religion i.e. the sense of meaning and purpose and belonging etc, REQUIRE a framework of nonsense to underpin them, i.e. a commonly believed set of myths about life the universe and everything with accompanying rituals and sacred places/objects/people. What interests me is the possibility that we heathen could create something akin to a religious communit ourselves, replacing the underpinning BS with something better. @Ultimate evidence- numerology (your website) is not “empirical evidence” of anything except insanity I’m afraid. I’m truly sorry. You need help. @Spoing. I think I agree with you- temprementally I am closer to Dennetts attitude (study religion- its a natural phenomenon) rather than Dawkins (if people just stopped being so stupid it would go away). However, having worked in a faith school I can undertsand the anger sometimes! Daoloth: @Ultimate evidence- numerology (your website) is not “empirical evidence” of anything except insanity I’m afraid. I’m truly sorry. You need help. U-E: There is a big difference between baseless numerology, and perfectly created “Symmetry & Mathematics” in the Universe, and in the WORD of God! If you already really went to the site and witnessed those 14 critical documents in which this perfect “Symmetry & Mathematics” openly presented therein, and you still think those are baseless numerologies, then I’m, too, truly sorry for you. So GOD is not a baseless numerologist, but He must be thus a Most Expert Mathematician who can create these perfect “Symmetry & Mathematics” both in Nature and in His Word, to show us His Presence and Omnipotence herein! I expect, much more will be discovered in this regard, in near future. But If you don’t want GOD in your life in any circumstance, no matter what, I can understand that, and in that case I really wish you a happy life then herein, based on mutual respect and peace between Atheists and Theists and all humanity in general. Because I believe, GOD created this world for all humanity that they may live in Peace and mutual Respect, as much as possible, not War and mutual Conflict and Ridicule. Who talks like THAT these days? Mental. but what do you think about those perfect “Symmetry & Mathematics” discovered in DNA, and then in Darwin’s Finches, above? real “Intelligent Mathematical Designs” in nature, or “Delusional” in your mind? @UA. You offer a very dualistic choice. What about (c): none of the above? I accept that fractal geometry underlies lots of natural and biological structures. DNA is a data routine, and I’m not surprised to see actors upon X,Y axes amongst that data – I think we’d be surprised to see multi-cellular organisms grow without it! Finch beaks, mammalian coat patterns, butterfly wings are all controlled by fractal integers, for example. Your basic argument is the hoary old ID one: It’s too perfect to be an accident (or too complex to comprehend), therefore it must be God. That’s surely just small-minded? The nail in your coffin is that by representing your results as a pie chart and moving the four triplets around you get a peace symbol. WTF? I can do that with any pair of different sized sectors, what does it prove? Answer: That I have an ability to make patterns. If I publish the results with claims of supernatural grand-mastery, however, it proves I have joined the tin-foil hat brigade and need help to get over my delusional belief in fairies. @U-E: are the 14 points about symmetry, mathematics, numerology, etc. what convinced you in the existence of gods and their prophets? Or did you happen to be raised in or influenced by a religious community and only after you were already indoctrinated tried to use apologetics and misapplication of unrelated phenomena in your question-begging bowl? Human behavior seems to be that “belief” leads one to seek confirmation of already held belief, not dismissal. I do it myself when I look things up on the web. The difference between myself & a delusional is that I’m aware of this human failing and I fight against it becoming what controls my behavior, thinking & beliefs. Learning to accept being incorrect and changing one’s beliefs based on overwhelming evidence is what being open-minded really is. It pains me how the concept of “open mindedness” is hijacked by believers of superstition. What’s worse is when the need for one’s belief to be “true” is so critical that the belief tries to hijack reality… Numerology? Fractals as proof of god? The natural universe is far more impressive than the typical human mind is comfortable managing. Closed narrow minds create a god to encapsulate the complexities with which they cannot otherwise emotionally/intellectually cope. CSM, is it really you? Have you really come among us unworthy blasphemous heathens to save us with your divine word? Please say it’s true. The One True Very Last Greatest Prophet Ever Forever And Forever is Mr. Lucas and the One True Very Last Authentic Gospel Is The Gospel Of The Very Truly Lastest Ever And Truly Final Prophet, Yoda. “True or not true, there is no ‘lie’.” Yoda, waxing metaphysical. Just after lying through its teeth. How do we know Yodaism is The Very True Truth And The Final Word? Well, for one thing it makes more money than the rest put together. Then there is the indisputable fact that only The Sith speak in absolutes so that proves Yodaism to be absolutely The Final Ultimate Truth. The knowledge that spaceships do make noises when in a vacuum, as testified to in the Holy Images, is further proof of the prophetic powers of the One True Final Ultimate Last Testaments. The final and undeniable proof, if anything else was needed is that Yoda prophesied and testamented after all of the others. Yoda is the Final True Forever Last Prophet Ever. You’re not supposed to notice the contradiction. That’s part of The One True Final Absolutely Ultimate Truth.